The monofilament line is a recent and much-welcomed addition to the world of angling, having brought with it innovations that make fishing that much easier and more fun. Among other characteristics, mono is ultra-sensitive, yet tough enough to withstand harsh weather conditions, underwater abrasions, and hard bites. It has a winning combination of versatility and flexibility and is suitable for a range of applications, which makes it a worthy investment for anglers. Now, if you're curious to find out what exactly makes a mono line and what you should look for when purchasing one, then read on. Monofilament is made from PV﻿﻿﻿DF or Fluorocarbon fiber, in combination with other polymers like extruded nylon. When the extrusion process has been done right, you'll find that the line is robust, has good knot strength, provides smooth casting, and all the other technical features that anglers are after. However, due to individual manufacturing bloopers, different lines vary in their strength, sensitivity, and cast ability, etc. Nevertheless, a unique characteristic of a monofilament line is it's invisibleness underwater. This feature makes it easier to catch more fish because they never see it coming. A few of the factors that determine a mono line's quality and performance include its diameter, stretch, suppleness, smoothness, knot strength, memory, and abrasion resistance. Knot Strength: As a feature, knot strength is a 'nice to have' when it comes to mono lines, and can only be observed by first-hand experience when angling with the line itself. So it's hard to tell whether the line can tie strong knots or not before you test it, and that's where reviews from other anglers can be helpful. Diameter: A line with a lower diameter is always preferable, as it's easier to store in the reel spool. Memory: The less memory a line has, the better because you want your casting to be smooth without always having to replace it. Abrasion Resistance: Resistance to abrasion refers to a line's ability to withstand rubbing up against rocks and sharp teeth bites without breaking. Suppleness: A line's suppleness often results in better castability overall, and a more supple line can be cast for long distances. 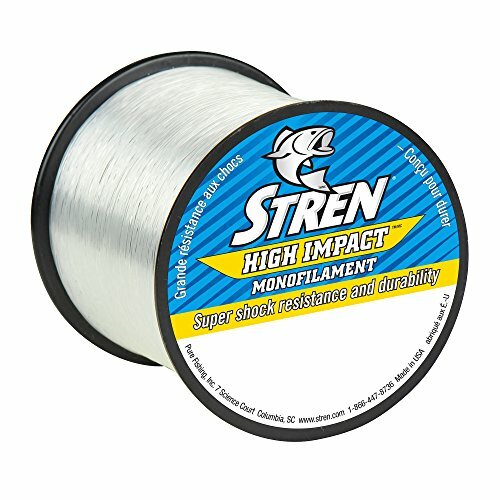 Strength: Mono lines are usually available in various sizes with different test strengths, from a little 1 lbs bait fishing line, to ones that can handle 600 lbs targets. In essence, the stronger the line's test strength, the better able it is to reel in big catches without breaking. Colors: Mono lines are also available in different colors to cater to different applications. The most popular among anglers is the clear variety, while ultraviolet blue is considered second best, with its ability to remain transparent underwater and visible above water. Some even glow in daylight and dark light, which makes for ideal night fishing. Accessibility: Lastly, the mono line is cheaper to produce, which makes it a more affordable option for most anglers. This mono line is known for its ability to hold strong when angling for big game, and it's versatile enough to crossover from salt water fishing to freshwater without a problem. Apart from being abrasion-resistant, this line is also shock resistant, which gives it more power to reel in big fish. 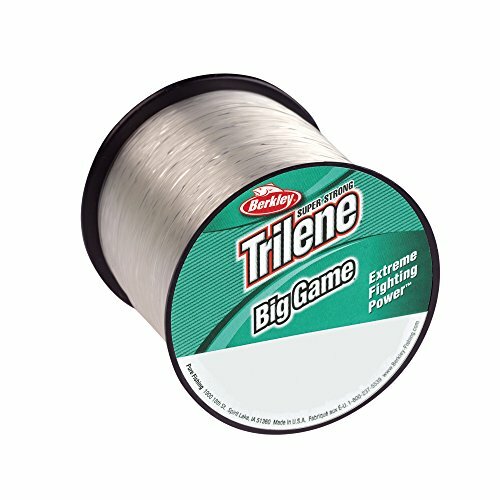 The Trilene knot is recommended for this line to perform optimally, and it's available in a wide variety of colors to suit different conditions and applications. This line is a bit stiff and not as versatile as one would expect. But it remains useful when casting reels and pitching in heavy cover. This particular line is made from extruded nylon, and it offers features such as superior shock resistance and long-term durability. It's popular with saltwater anglers for its ability to handle coastal and offshore applications with ease. It's available in sizes from 10 lbs. At 1275 yards, all the way up to 30 pounds at 400 yards. Although this line can maintain low memory for a long time, it is advisable not to overfill the spool, as this will most likely lead to a birds nest type of situation. Also, this line works for a number of applications, especially saltwater fishing, as it maintains low visibility under water and yet is easily perceptible from above the water. 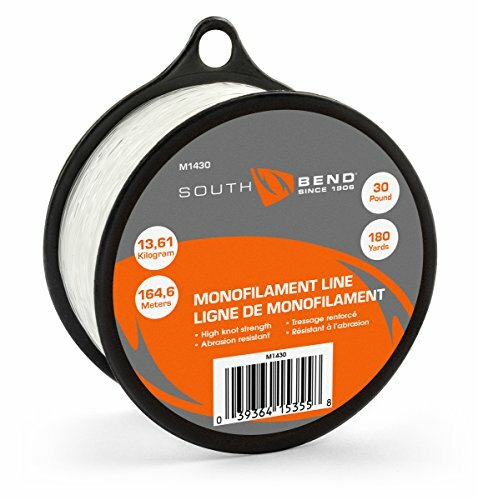 South Bend is an ultra-clear and abrasion resistant mono fishing line. It has a high knot strength rating, and its knots stay in place. You can get this robust line in different sizes and lengths, from 4 lbs at 1125 yards, to 60 lbs at 100 yards. Its appearance remains translucent underwater, and it can catch more fish due to its invisibility. It also makes fantastic braid backing and leader material. Overall, it's the perfect line for novice anglers, as it's ideal for catching smaller fish. This smooth and supple monofilament line is known for being easy to handle and boasts exceptional accuracy when casting for long distances. It goes through a Proprietary Extrusion Process as well as G2 precision winding during the manufacturing process, which almost eliminates the development of memory overtime. 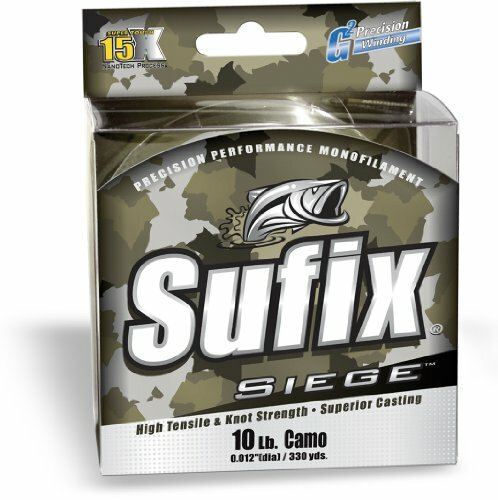 Also, this line offers up to 15x more resistance against abrasions when compared with other lines on the market, and it has high tensile strength, which means you won't lose your lure with this. This versatile line can make a braid and a fuse, and it's available in several test strengths from 4 lbs. to 20 lbs. Plus, you can get it in two colors, namely camo, and tangerine, which allows you to remain incognito to catch more fish. Lastly, it performs beautifully in all conditions and applications, from ponds with thick vegetation, to saltwater applications. 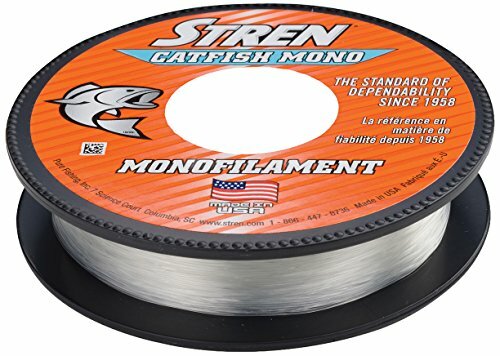 As the name suggests, the Stren Monofilament fishing line is perfect for reeling in catfish and other big game. It's a tough line that's able to resist abrasions from brushing up against rocks and other below the surface structure. It's available in a variety of transparent colors, and it glows in the daylight as well as dark light, remaining highly visible to you and completely invisible to the fish. The Stren is a durable line that can last for a long time. It's able to retain its color and develops very little memory over time, allowing you to fish with it for longer. It's available in sizes and test strengths that range from 20 lbs at 200 yards to 10 lbs at 1250 yards. This mono line also handles well and has a great casting range. You can use this for a number of applications, and it's a sensitive line that's able to feel slight movements immediately. Lastly, it's easy to tie knots on this line, and they hold up very well. 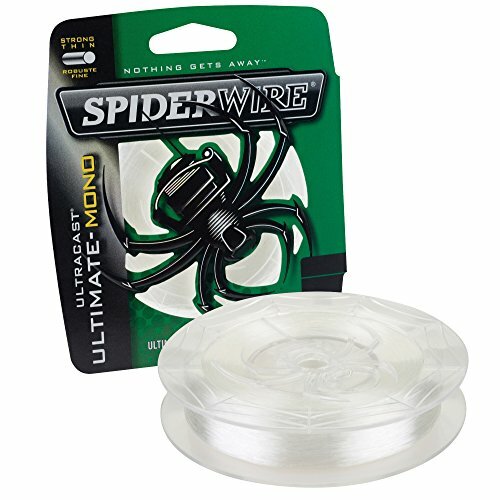 The Spiderwise Ultracast is a co-polymer mono line, a combination which gives it more strength-per-diameter than your usual mono line, about 33% stronger to be exact. It has less stretch as well, which makes it more sensitive to bites and nibbles. Its sensitivity is further enhanced by its thin diameter, making for extraordinary bait action. ​You can use this monofilament fishing line for various applications, whether you're casting or spinning. In fact, this line casts beautifully and can go for very long distances. Comes as a clear, colorless line. As you can see, the mono line offers up a lot of benefits for anglers, from smooth casting, tying up strong knots and having low visibility, to resisting abrasions and providing exceptional strength and power to reel in big game without breaking. These fantastic characteristics are what set this type of line apart from the rest, and it's relatively cheaper when compared to other fishing lines, which makes it even more accessible and sought after. But the most endearing quality of a mono line is its versatility. You can use it with any reel, and some can transition from saltwater to freshwater without changing their structure. Essentially, mono just makes angling fun and more accessible than before. And once you've loaded up with your spool of mono, the only question you'll be asking is, anyone for a fishing trip?